UKIP MEP Bill Etheridge launches his leadership campaign with defence spokesman Mike Hookem MEP as running mate. UKIP MEP Bill Etheridge launches his leadership campaign backed by party defence spokesman Mike Hookem MEP. West Midlands MEP Bill Etheridge has formally launched his campaign for the leadership of UKIP at the Young Independence conference in Manchester today. “Having a system where people are dependent on state hand outs like tax credits when they have to give away a chunk of their salary in tax is nonsensical and an utter waste of money,” he said. “What is the point of taking someone’s money only to give it back to them – minus the money the administration costs – is economically illiterate,” he said. He also vowed to abolish inheritance tax and slash ‘sin taxes’ and fuel duty as part of a fiscal shake up which would put the economy at the heart of UKIP’s manifesto. “For the majority of UKIP’s existence our focus has – understandably – been about getting the UK out of the EU and back on the world stage,” he said. “Particularly under the leadership of Nigel Farage we have always had a full manifesto but this was bound by our needing to leave the EU first. “UKIP has to be the party who not only won this country the referendum but that backs the UK as a world player. “I want to be the voice of ordinary people and fight for them to have the freedom to aspire. I want them to have the freedom to earn a living, look after their family, feel proud of where they come from, be educated, be healthy even just to have a good time over a pint in their local pub. Mr Etheridge is being backed by the party’s defence spokesman Mike Hookem MEP, who represents Yorkshire and North Lincolnshire in the European Parliament. “I am backing Bill because I believe he is the man with whom the membership can trust the values of UKIP with: we have always been different, and proud to be different, by not trying to fit the establishment mould but instead being a truly representative party. “We believe that everyone should have the opportunity to succeed based on merit, not just those who hail from wealthy backgrounds as so many of our MPs these days are. “UKIP is the party of the Armed Forces and of veterans – a group of people who have been disgracefully let down by successive governments. “As a former soldier and someone who has lived and worked with service personnel and veterans ensuring a strong, properly equipped Armed Forces – which is not sent out to illegal wars on the basis of flawed intelligence – is my priority. Caption: UKIP Leadership candidate, Bill Etheridge MEP (right) announces that Yorkshire & North Lincs. 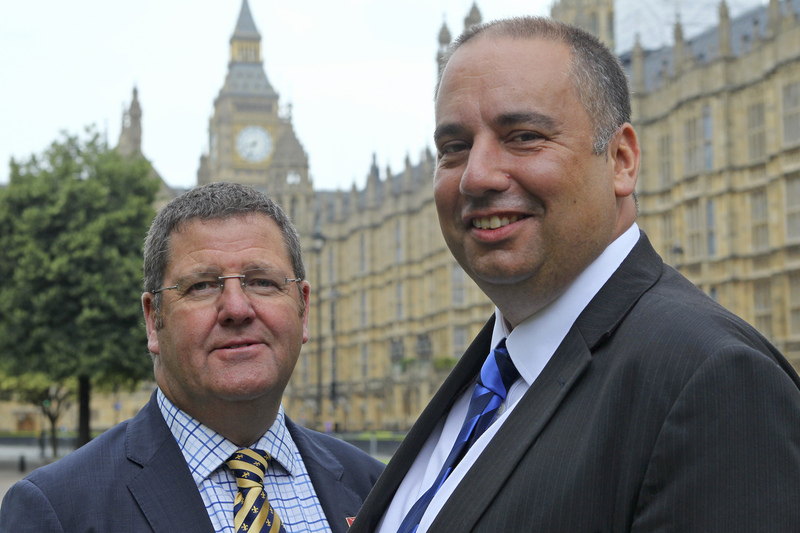 MEP, Mike Hookem (left) will be his running mate for deputy leader. This entry was posted in UKIP and tagged Bill Etheridge, Mike Hookem, UKIP by Rik. Bookmark the permalink.